With searches for America's favorite breakfast meat climbing steadily over the past five years, "bacon" is one of the Google's top growing trends — a trend that spikes around Thanksgiving and Christmas. A year and a half ago, in a post titled "Ok Internet, Let’s Let the Bacon Meme Go," Feminist blog Jezebel pointed to the Keds bacon shoe as “what just might be the final stop on the 'OMG BACON' Express." Alas, less than a month later fellow Gawker Media tech blog Gizmodo, in a post about a Space Invaders-themed "Bacon Bits" T-shirt , stated the reality: "We've all underestimated the power of the recent bacon movement." Turns out, the "OMG BACON Express" is a high sodium, fat-laden runaway train unstoppable even by Denzel Washington and that guy who played Captain Kirk in the J.J. Abrams' "Star Trek" reboot . Especially around the holidays. With searches for America's favorite breakfast meat climbing steadily over the past five years, "bacon" is one of the Google's top growing trends — a trend that spikes around Thanksgiving and Christmas. According to Google search numbers , "bacon" enjoyed a brief spike in its climb around Thanksgiving, when "bacon recipes" topped requests. 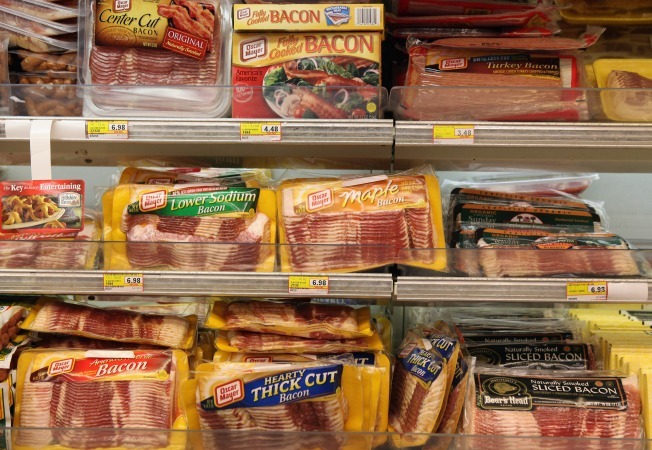 If last year's trend holds, "bacon" is set to spike again as Christmas grows closer and the search for bacon–themed gifts heats up. Certainly, there's no dearth of bacon-related gifts to be found on the World Wide Web. Seattle-based novelty king Archie McPhee , known for its historically accurate action figures and complete line of rubber "Devil Duckies " (among thousands of other things) boasts a dedicated "Bacon & Meat" section featuring more than 50 carne-themed products. From bacon gift wrap, bacon air freshener, bacon-flavored gum to bacon, belts, wallets and watches to Mr. Bacon's Big Adventure Board Game. While you may not readily find a buyable bacon lamp or the formidable BA-K-47 , ThinkGeek offers Tac Bac Tactical Canned Bacon — 18 servings of fully-cooked bacon with a 10-plus year shelf life. The Internet outpost for all manner of nerd ephemera offers approximately 30 bacon-themed gift ideas, including squeeze bacon and Baconnaise , sizzling bacon candles and a full line of bacon-based t-shirts . Wear them all in good health while you enjoy Bakon Vodka (bacon-flavored vodka) instead of egg nog this year. Remember, it's never too early to get kids hooked on bacon — especially for the holidays. My First Bacon talking plush toy, for example, is an excellent gift if you're shopping for young "King Curtis," (aka "Bacon Kid") whose massively remixed words are memorialized in the hit YouTube video, "Bacon is Good For Me." Helen A.S. Popkin requires only the flimsiest pretense to post this "Bacon is Good For Me" video. Follow her on on Twitter and/or Facebook . and she'll prove it!